We knew all along that the vibrations of bike and rider absorbed energy and slowed the bike down, but nobody had ever quantified this. So we took a bike with a Power Meter to a road with two adjacent surfaces: very rough (rumble strips) and very smooth (new pavement). This allowed us to assess the additional suspension losses due to the rougher surface. The results surprised even us: Suspension losses can be huge. The worst-case scenario had the rider lose 290 Watts to the shaking of the bike and rider. To find out how to reduce suspension losses, we tested various tires, flexible and suspension forks, and even padded handlebars. One surprising result was that the suspension fork was faster than a super-stiff fork even on smooth pavement! The cobblestones of the famous Paris-Roubaix race are similar to the rumble strips on which we tested suspension losses. In a special feature with beautiful photos by professional photographer John Pierce, we looked at the equipment of the racers in the “Hell of the North” and predicted that going to wider tires and lower pressures, the pros could go faster. 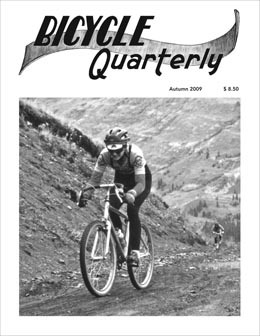 It appears the pros read Bicycle Quarterly, because already the following year, tires at Paris-Roubaix became wider, a trend that has continued. Instead of 24 or 26 mm-wide tires, today’s pros ride 30s or even 32s over the cobbles of northern France. Jacquie Phelan is one of the most charismatic racers of all time. In our exclusive interview, she talks about how she raced on the road, but switched to mountain bikes because it was more fun. Evocative photos from the first NORBA championships complete this voyage to the early days of mountain biking. To round off this issue, we tested a Surly Long-Haul Trucker and a Breezer Finesse. Find out how the iconic touring bike holds up under Bicycle Quarterly’s laser-like scrutiny, and see whether Breezer’s “performance commuter” lives up to its promise. 18 The Bicycles for Paris-Roubaix: Can technology conquer the "Hell of the North"?